In economics, a service is a transaction in which no physical goods are transferred from the seller to the buyer. The benefits of such a service are held to be demonstrated by the buyer's willingness to make the exchange. Public services are those that society (nation state, fiscal union, region) as a whole pays for. Using resources, skill, ingenuity, and experience, service providers benefit service consumers. Service is intangible in nature. Services can be described in terms of I's. Services are by definition intangible. They are not manufactured, transported or stocked. Services cannot be stored for a future use. They are produced and consumed simultaneously. Service-relevant resources, processes and systems are assigned for service delivery during a specific period in time. If the service consumer does not request and consume the service during this period, the related resources may go unused. From the perspective of the service provider, this is a lost business opportunity if no other use for those resources is available. Examples: A hairdresser serves another client. An empty seat on an airplane cannot be filled after departure. When the service has been completely rendered to the consumer, this particular service irreversibly vanishes. Example: a passenger has been transported to the destination. The service provider must deliver the service at the time of service consumption. The service is not manifested in a physical object that is independent of the provider. The service consumer is also inseparable from service delivery. Examples: The service consumer must sit in the hairdresser's chair, or in the airplane seat. Correspondingly, the hairdresser or the pilot must be in the shop or plane, respectively, to deliver the service. Each service is unique. It can never be exactly repeated as the time, location, circumstances, conditions, current configurations and/or as signed resources are different for the next delivery, even if the same service consumer requests the same service. Many services are regarded as heterogeneous and are typically modified for each service consumer or each service contextual . Example: The taxi service which transports the service consumer from home to work is different from the taxi service which transports the same service consumer from work to home – another point in time, the other direction, possibly another route, probably another taxi driver and cab. Another and more common term for this is heterogeneity. Mass generation and delivery of services must be mastered for a service provider to expand. This can be seen as a problem of service quality. Both inputs and outputs to the processes involved providing services are highly variable, as are the relationships between these processes, making it difficult to maintain consistent service quality. Many services involve variable human activity, rather than a precisely determined process; exceptions include utilities. The human factor is often the key success factor in service provision. Demand can vary by season, time of day, business cycle, etc. Consistency is necessary to create enduring business relationships. Any service can be clearly and completely, consistently and concisely specified by means of standard attributes that conform to the MECE principle (Mutually Exclusive, Collectively Exhaustive). Service consumer benefits – (set of) benefits that are triggerable, consumable and effectively utilizable for any authorized service consumer and that are rendered upon request. These benefits must be described in terms that are meaningful to consumers. Service-specific functional parameters – parameters that are essential to the respective service and that describe the important dimension(s) of the servicescape, the service output or the service outcome, e.g. whether the passenger sits in an aisle or window seat. Service delivery point – the physical location and/or logical interface where the benefits of the service are rendered to the consumer. At this point the service delivery preparation can be assessed and delivery can be monitored and controlled. Service consumer count – the number of consumers that are enabled to consume a service. Service consumer support language – the language(s) spoken by the service desk. Service fulfillment target – the provider's promise to deliver the service, expressed as the ratio of the count of successful service deliveries to the count of service requests by a single consumer or consumer group over some time period. Service impairment duration – the maximum allowable interval between the first occurrence of a service impairment and the full resumption and completion of the service delivery. Service delivery duration – the maximum allowable period for effectively rendering all service benefits to the consumer. Service delivery unit – the scope/number of action(s) that constitute a delivered service.Serves as the reference object for the Service Delivering Price, for all service costs as well as for charging and billing. Service delivery price – the amount of money the customer pays to receive a service. Typically, the price includes a service access price that qualifies the consumer to request the service and a service consumption price for each delivered service. The service encounter is defined as all activities involved in the service delivery process. Some service managers use the term "moment of truth" to indicate that point in a service encounter where interactions are most intense. Many business theorists view service provision as a performance or act (sometimes humorously referred to as dramalurgy, perhaps in reference to dramaturgy). The location of the service delivery is referred to as the stage and the objects that facilitate the service process are called props. A script is a sequence of behaviors followed by those involved, including the client(s). Some service dramas are tightly scripted, others are more ad lib. Role congruence occurs when each actor follows a script that harmonizes with the roles played by the other actors. In some service industries, especially health care, dispute resolution and social services, a popular concept is the idea of the caseload, which refers to the total number of patients, clients, litigants, or claimants for which a given employee is responsible. Employees must balance the needs of each individual case against the needs of all other current cases as well as their own needs. Lovelock used the number of delivery sites (whether single or multiple) and the method of delivery to classify services in a 2 x 3 matrix. Then implications are that the convenience of receiving the service is the lowest when the customer has to come to the service and must use a single or specific outlet. Convenience increases (to a point) as the number of service points increase. The distinction between a good and a service remains disputed. The perspective in the late-eighteenth and early-nineteenth centuries focused on creation and possession of wealth. Classical economists contended that goods were objects of value over which ownership rights could be established and exchanged. Ownership implied tangible possession of an object that had been acquired through purchase, barter or gift from the producer or previous owner and was legally identifiable as the property of the current owner. Adam Smith’s famous book, The Wealth of Nations, published in 1776, distinguished between the outputs of what he termed "productive" and "unproductive" labor. The former, he stated, produced goods that could be stored after production and subsequently exchanged for money or other items of value. The latter, however useful or necessary, created services that perished at the time of production and therefore did not contribute to wealth. Building on this theme, French economist Jean-Baptiste Say argued that production and consumption were inseparable in services, coining the term "immaterial products" to describe them. Most modern business theorists describe a continuum with pure service on one terminal point and pure commodity good on the other. Most products fall between these two extremes. For example, a restaurant provides a physical good (the food), but also provides services in the form of ambience, the setting and clearing of the table, etc. And although some utilities actually deliver physical goods — like water utilities that deliver water — utilities are usually treated as services. 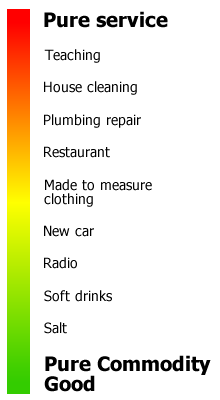 The following is a list of service industries, grouped into sectors. Parenthetical notations indicate how specific occupations and organizations can be regarded as service industries to the extent they provide an intangible service, as opposed to a tangible good. Below is a list of countries by service output at market exchange rates at peak level as of. The twenty largest countries by tertiary output (in nominal terms) at peak level as of 2018, according to the IMF and CIA World Factbook. ^ Anders Gustofsson and Michael D. Johnson, Competing in a Service Economy (SanFrancisco: Josey-Bass, 2003), p.7. Zeithaml, Valarie A.; Parasuraman, A.; Berry, Leonard L. (1990). Delivering Quality Service: Balancing Customer Perceptions and Expectations. Simon and Schuster. ISBN 978-0-02-935701-9. Johnston, Robert; Clark, Graham (2008). Service Operations Management: Improving Service Delivery. Financial Times/Prentice Hall. ISBN 978-1-4058-4732-2. Petit, Pascal (1991). "Services". In Eatwell, John; Newman, Peter K.; Milgate, Murray. The New Palgrave: A Dictionary of Economics. 4. Macmillan. pp. 314–15. ISBN 978-0-333-37235-7. Alan Pilkington, Kah Hin Chai, "Research Themes, Concepts and Relationships: A study of International Journal of Service Industry Management (1990 to 2005)," International Journal of Service Industry Management, (2008) Vol. 19, No. 1, pp. 83–110. Downton, Steve; Rustema, Hilbrand; van Veen, Jan (1 August 2010). Service Economics: Profitable Growth with a Brand Driven Service Strategy. Novetum Service Management, Limited. ISBN 978-9963-9838-0-3. This page was last edited on 16 March 2019, at 14:45 (UTC).